Over 700 people came together at the Wortham Center this past Wednesday night for "Timeless Leadership." 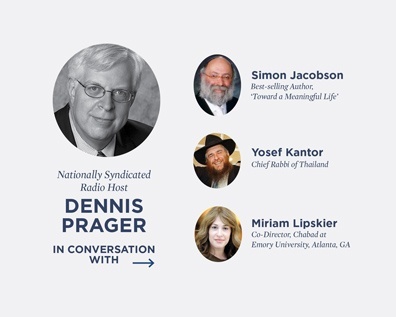 Nationally syndicated radio host, Dennis Prager, led a fascinating panel discussion featuring Miriam Lipsker, co-founder of Chabad at Emory University, Simon Jacobson, author of Toward a Meaningful Life and Rabbi Yosef Kantor, chief rabbi of Bangkok Thailand. The event was in commemoration of the upcoming 20th Yahrtzeit (anniversary of passing) of the Lubavitcher Rebbe, Rabbi Menachem M. Schneerson, OBM. 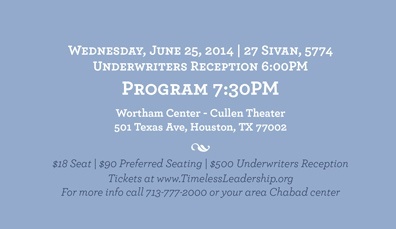 Timeless Leadership, will be held this Wednesday, June 25, 7:30 pm, at the Wortham Center. Don't miss out, book your ticket today! 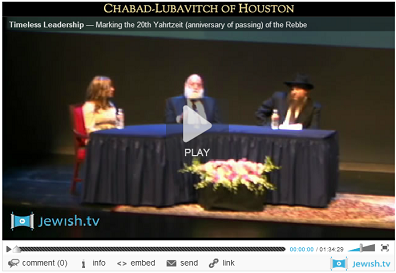 Learn about the life and legacy of the Rebbe, Rabbi Menachem M Schneerson in commemoration of his upcoming 20th Yahrzeit. The event will feature an on-stage panel discussion hosted by acclaimed media personality Dennis Prager in conversation with Simon Jacobson, bestselling author of Toward a Meaningful Life (Simon Schuster), Rabbi Joseph Kantor, chief rabbi of Thailand and founding director of Chabad Lubavitch of Thailand, and Miriam Lipsker, co-founder of Chabad at Emory University. A much-anticipated new biography about the Rebbe—Rabbi Menachem M. Schneerson, of righteous memory—sold out within hours of its release on Tuesday. 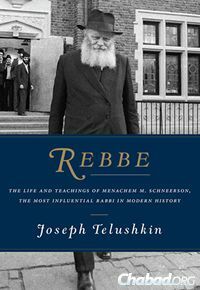 Rebbe: The Life and Teachings of Menachem M. Schneerson, the Most Influential Rabbi in Modern History by Joseph Telushkin also reached No. 15 on both Amazon’s and Barnes & Noble’s best-seller lists.